It’s delicata squash. It is back in my life again. This bad boy of a squash is sinfully sweet and creamy (like butternut, but even sweeter and creamier) and you can eat it without peeling (like kabocha, but the skin is thinner). Its sweetness gets even more intensified when roasted, and it is delicious as is or in salad – but with a little bit of butter and honey, as well as toasted pepitas and juicy pomegranate seeds sprinked over, it is practically a dessert that tastes as gorgeous as it looks. If you haven’t had them yet, I urge you to get some immediately, like today. Unless of course you live near me, in which case please get your hands off my share. 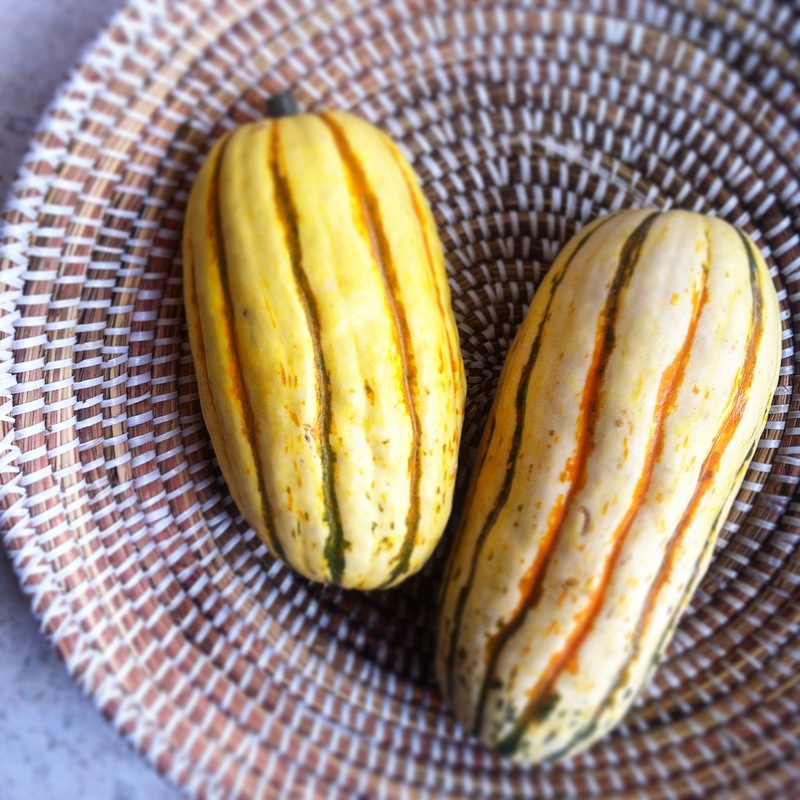 I strongly insisted that everybody try these squashes last year, so even my sister in Germany excitedly called me to let me know she found them except that what she described to me was not at all delicata squash. Sis, THESE are delicata squash just so we are clear. I don’t know what you fed your kids with and don’t want to be responsible. Preheat oven to 425º. Half delicata squash lengthwise and scrape seeds out with a spoon. Brush baking sheet with olive oil and place the squash halves, cut side down. Brush squash with remaining oil. Roast squash for 15 minutes. Take out and turn them so cut side is up, then roast another 10 minutes. While squash is roasting, toast pepitas by putting dry pan on medium heat and constantly shaking, until they lightly brown and make popping sounds, about 5 minutes. 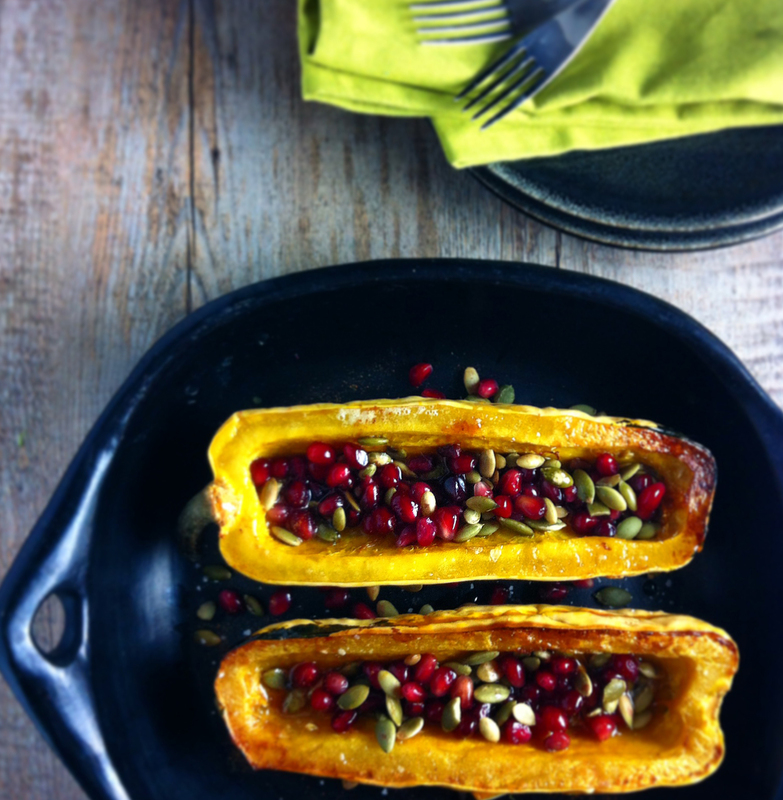 Put squash on a serving plate. While it is still hot, cut butter into small pieces and dot squash with them so they melt and scatter a pinch of salt. Drizzle with honey, then sprinkle (or stuff, as in the picture – I actually did mean to sprinke, but was overcome by my love for pomegranate and nuts) with pomegaranate seeds and toasted pepitas. Finish with a dash of cayenne. Original recipe called for more butter, and actually suggested to melt it and mix with cayenne to serve on the side like sauce so guests can drizzle it over squash themselves. I found it equally delicious with much less amount of butter dotted and melted over squash directly and am settled with this way.